Ah, Shonen Jump. My old nemesis. For years after I came back to anime and manga it was harder to buy a copy of SJ in Ireland than it was to find an honest politician. You couldn’t subscribe to it, you couldn’t buy directly from the US. The only thing you could do was buy it week to week whenever it came into the comic shop. Which meant that if the shop to put in a purchase order for that week and the magazine wasn't available to go with the order, you were stuffed, royally. In fact, randomly buying it off the shelf week to week was a surer way of reading the magazine. And so, I didn’t really bother reading it after more than a few months even if the storylines running intrigued me. I never did find out why SJ was never available for subscription. Without any real data, I’ll just blame Japan in general. 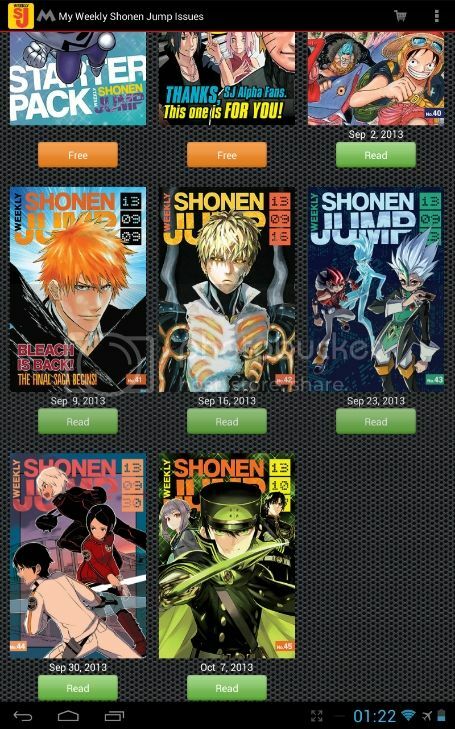 But in 2011, VIZ announced they were replacing Shonen Jump with Weekly Shonen Jump and going all digital. This made me cheer if only because now, the excuse of print costs could be swept away. I could finally read SJ, or as it was now being called WSJ, to my hearts content. Ah, well no. Seems Japan wanted to continue making money by not licensing their material to as many countries as possible (I can’t tell you the amount of times I’ve seen this successful idea not work). I don’t know what goes through their heads sometimes, I only know I rely on them for mass entertainment. So when they announced that WSJ would become available in Ireland, the UK, South Africa and other countries, I was stunned. 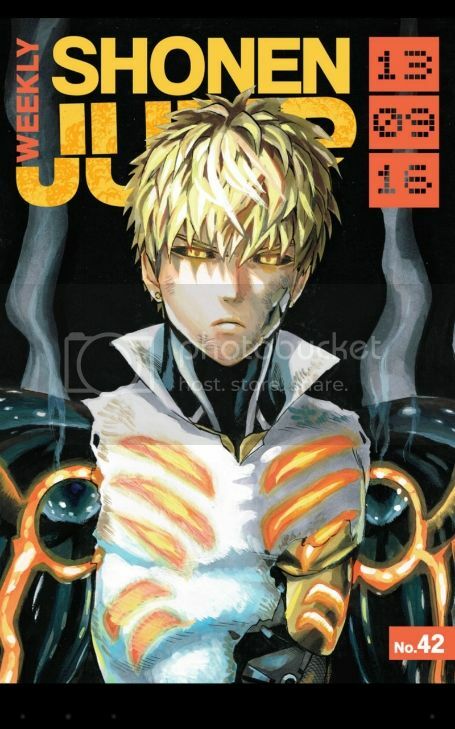 Keep in mind, Shonen Jump has been published in various forms for over 11 years in North America and this would be the first time I would be able to read it, legally, without having to sacrifice a goat on an altar made of bones or rely a comic shop that really couldn’t care less about magazines. 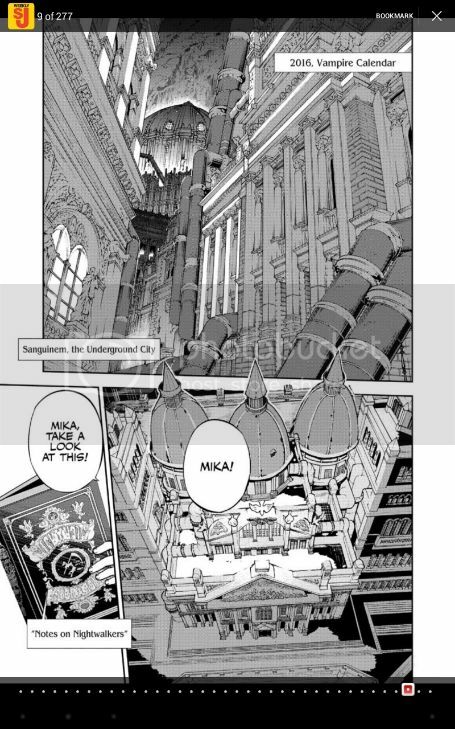 So the Android and iOS apps allow users to read manga chapters as they come out in nearly real time. Now a lot more of us get to join in the party. So let’s have a look at the app on Android (I’ll be using my Android tablet for this). Then we’ll look at the good and the bad of the service. First up, here’s the main screen on Android. The current issue is displayed at the bottom of the page along with your subscription status. On the top is a banner which keeps showing the same banner as if it wants to show more but can’t because of content restrictions (we’ll come back to that later). Next up is the issue selection screen. If you’ve just downloaded the app, you can purchase individual issues while subscribers will see all current and previous issues since the subscription was started. Finally here’s a sample page from the reader itself. Here you can move the page to any page in the issue by sliding along the timeline bar which is usually hidden from view until you tap the screen. There’s also a bookmark page so you can exit the app and come back. So now that we’ve had a look at the app lets talk about it and the service, both the good and the bad points. 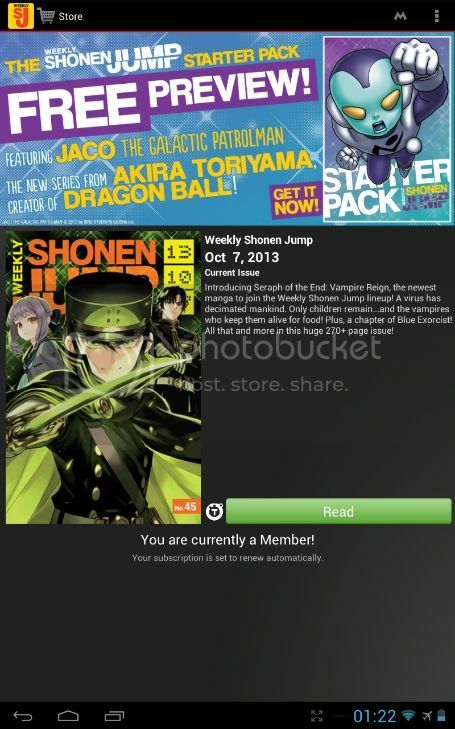 It’s Weekly Shonen Jump. If you’re a manga fan and you’re not happy at reading something like this, then I can’t help you. I just can’t. It’s cheap. At €2.33 per month and four issues a month, it’s an inexpensive proposition to subscribe. If you’re not liking what you read, you can cancel, keep your issues and move on to pastures new. I’ve said it before but content is king in the manga and anime publishing industry. The more content you have and the easier you make it for people to get to the content, the better off you will be as a business and industry. The days of running a slipshod website with DRM restrictions and limited offerings is over. It’s easy to use. From the download screen on my Google Play store app, there are two screens to pass through to get to read WSJ. No reminder ads, extra agreements to click or anything to distract from the main draw of the app. It reads from right to left which is brilliant if you’re now used to reading manga. The main splash page for each issue lets you know where each chapter starts and stops. Simply slide over the timeline bar to start reading on a manga that you like. Oh boy. This is where the angry me comes out. There’s no option to download back issues on Android. On iOS apparently you can do this but on Android, it is not possible. It can’t be a rights issue so it has to be a technical problem. If you can’t read previous stories that you just started reading and want to read the beginning then you’ll have a bunch of people reading from chapter 223 of Toriko with no chance of knowing who the characters are. Hopefully VIZ will correct this soon. Some of the features don’t make a lot of sense. Why is there a bookmark feature? It’s a magazine and if I can’t select the bookmark right after starting the app, then I might as well load the issue from the start and scroll until I find the spot I was reading. I don’t think I’ll put the tablet down and then forget about for six months. So it isn’t a feature you'll use all that often. Also, why is there a separate page to delete issues I’ve downloaded from the onboard memory? Shouldn’t there be that option from the issue screen? It’s only half an app and half a service. Since VIZ moved to a digital and print strategy in 2011, I have said that offering the service to only American audiences does the other English speaking territories a disservice and robs the licensors of extra cash flow. When they revamped WSJ into their digital platform idea they married their digital manga store into the WSJ app. This means you can buy the manga for the series you currently reading. This means there is no delay in purchasing and no chance the reader will become distracted. On the non-US version of WSJ, there is no store front because there is no strategy. You can’t purchase any and I mean ANY of VIZ’ titles in digital form outside the US on Android or iOS. You can for the Nook in the UK but I don’t even think it is as good a selection as on the US side of things. If I hear the words "yeah, it’s a rights issue" I will reply in as calm a voice as possible that that is a load of baloney. VIZ sell physical volumes of the same series on both sides of the pond. They are not fighting anyone for rights. VIZ have had two years and successfully launched the WSJ service on both sides of the Atlantic. There can’t be any more rights issues. Why has there been no sign that VIZ, one of the largest publishers of manga in English, has any idea about how to proceed? You are still a second class customer. On the N. American WSJ site, subscribers can read their purchased issues on the web browser reader. You can’t do that if you live outside the US. There is no option to do so. So if you don’t have your phone or tablet with you, it’s a useless service. I can see that I’m a subscriber to the service from WSJ’ user account page. But any attempt to read my legally purchased content hits a roadblock. While we’re on the subject of being a subscriber, you can’t take out yearly subscriptions to WSJ if you’re not in the US. You must pay a monthly fee. And since you are only a filthy monthly subscriber, you don’t qualify for any free stuff like Yu-Gi-Oh cards (personally I don’t care about them but some might). Thanks for your interest in the VIZ Manga app! While at this time the VIZ Manga app is not officially supported on 10" tablets, you *can* access our app on your tablet through the Amazon app store. We know this is only a temporary solution, and truly hope there is room for expansion onto larger tablets in the future. Now, to be fair the person was trying to be helpful but it doesn’t make any sense why Android tablet customers are left out when the iPad users can use the service. So only phones and seven inch tablets can be used from the Android platform. I don’t want to be completely negative on VIZ and their efforts. They have successfully launched a weekly manga magazine which keeps up with the Japanese version almost in real time. I can finally keep up with stories and characters that I like and support the industry directly. But it’s so frustrating to want to support the legitimate sources for anime and manga and being hamstrung. It feels like seeing the other kids leaving the playground that you now get to play in only to find out they’re moving next door to fancier digs.